UBP684 is a novel NMDAR PAM (positive allosteric modulator) which robustly potentiates responses at all GluN1/GluN2 subtypes and at neuronal NMDARs. UBP684 increases the maximal l-glutamate/glycine response while having minor subunit-specific effects on agonist potency. 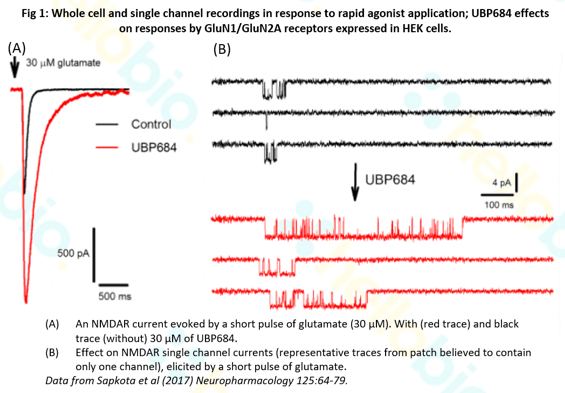 UBP684 increases NMDAR channel open probability (Po) and slows receptor deactivation time upon removal of L-glutamate but not glycine. Docking studies suggest that UBP684 binds to the GluN1 and GluN2 LBD (ligand binding domain) interface supporting its potential ability in stabilizing the LBD closed conformation. UBP684 binding is independent of agonist binding and its activity is independent of membrane voltage and redox state. UBP684 activity is also pH-dependent, with enhanced potentiation at lower pHs and inhibitory activity at high pH (e.g.8.4). University of Nebraska researchers recommend making up UBP684 as a 50 mM stock solution in DMSO and diluting it into physiological buffer up to 50 µM. Please note that UBP684 is less soluble in physiological buffers that have mM levels of calcium. UBP684 can be used in buffers usually used for studying NMDAR responses in Xenopus oocytes, however it may not work well in buffers used to investigate synaptic transmission. Calcium-free buffers can be used to improve compound solubility. Mechanism and properties of positive allosteric modulation of N-methyl-d-aspartate receptors by 6-alkyl 2-naphthoic acid derivatives. A single-channel mechanism for pharmacological potentiation of GluN1/GluN2A NMDA receptors.